First, Keep mouse and keyboard close to edge of table to reduce forward arm extension; Second, Keep mouse close to keyboard to reduce lateral arm extension; Third, Try to move the mouse by arm instead of wrist to reduce wrist extension. 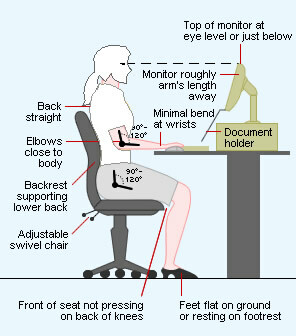 Adjust the armrest of the office chair so that it just slightly lifts your arms at the shoulders. Use of an armrest on your office chair is important to take some of the strain off your neck and shoulders, and it should make you less likely to slouch forward in your chair. No matter how comfortable one is in a workstaion, prolonged static posture is not good for the back, hand and is a common contributor to back and hand problems and muscle strain. Remember to stand, stretch and walk for at least a minute or two every half hour. Even a quick stretch or some minimal movement – such as walking to the water cooler or bathroom – will help.